lt;stronggt;SAF2461SLlt;/stronggt;lt;BR/gt;Safco Cha-Cha Sitting Height Table Baselt;BR/gt;Sitting height table base works its wonders across your space, inviting casual conversations, meetings, and project collaboration. Use them for meeting spaces, gathering areas, breakrooms, eating spaces and casual work areas to inspire a better way to work. Top and Base sold and shipped separatelyORDER BOTH. 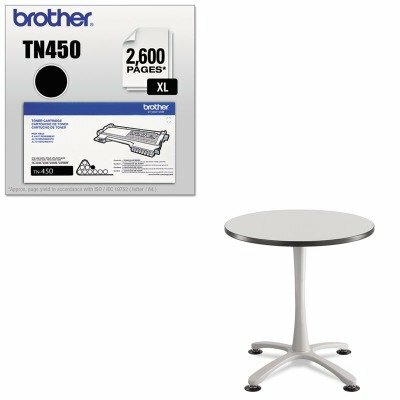 Base Color: Silver Height Maximum: 29amp;quot; Base/Leg Material: Steel Base Type: X-Base.lt;BR/gt;lt;BR/gt;lt;stronggt;BRTTN450lt;/stronggt;lt;BR/gt;Safco Cha-Cha Sitting Height Table Baselt;BR/gt;Toner that will perform when your requirements are most demanding. Each cartridge produces solid blacks and vibrant colors for eye-catching graphics. Increase productivity and reduce costs when each cartridge delivers value and dependability. Device Types: Multifunction Laser Printer OEM/Compatible: OEM Page-Yield: 2600 Supply Type: Toner.